Oh, Rainbow Rowell. Your writing is always quirky and cute and witty and smart. But alas, this book did not live up to my expectations post-Eleanor and Park. There was A LOT going on in this book. A lot. A WHOLE LOT. And as ambitious as it was to keep all of the plot points and crises in the air, it got a bit muddled. Cath and Wren Avery are twins moving away to college for the first time. Cath is our protagonist, and she deals with a lot of social anxiety issues. To cap it all off, since arriving at university,Wren doesn't want much to do with Cath. She's ready to spread her wings and fly (drink, go to frat parties). Cath is left with a weird roommate named Reagan and her roommate's overly enthusiastic maybe-boyfriend, Levi. Cath is grappling with the college experience all the way around. 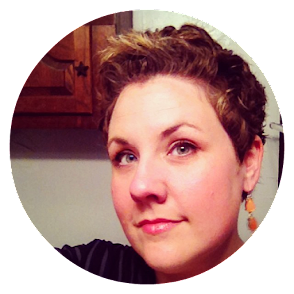 From navigating the cafeteria to figuring out her Fiction Writing class. She finds solace in fandom and writing fan fiction about a book series that sounds oddly like Harry Potter, but in this case called the Simon Snow series. Each chapter in the book is rounded out by an excerpt from the Simon Snow novels, OR an excerpt of Cath's fan fiction version of Simon Snow. And as if that wasn't enough, Cath's dad is manic-depressive so she worries about him. And her long-gone mother is back on the scene and seemingly wants to rehash her relationship with the twin daughters she abandoned. Oh, and there are love problems (Levi isn't Regan's boyfriend; he likes Cath), and then there's her squirrely Fiction Writing partner. OMG! All the problems. All the conflicts. All the crises! If you enjoyed Rainbow Rowell's writing in Eleanor and Park, you should definitely give this one a go. If you're new to Rowell's work, start with Eleanor and Park. Seriously. This was a cute, fun book, but the gazillion issues were annoying at times. As were all the Simon Snow bits. Truthfully, I just find it hard to care about a fake novel that sounds too much like HP. Where Rowell shines in this novel is in Cath's relationships with the people closest to her. Reagan and Cath's interactions are spirited and witty. Cath's relationship with Levi is a hoot, and sweet, and intense. Her relationship with her twin sister is complicated and multifaceted. If the focus of the book had remained on these characters, I think it would've been a much stronger novel. The other plot threads seemed unexamined and superfluous. I stayed up entirely too late reading this book (on a work night), and I really enjoyed parts of it while I found myself skimming others. I will most certainly read more of Rainbow Rowell--I'm looking forward to Attachments--but if you're looking for another Eleanor and Park, this isn't it. Thank you! Definitely come down off the high or it will pale in comparison. I'm with Monika -- I want to read this but I have to leave sometime between E&P before starting it. It sounds does sound cute. I hope you enjoy Attachments. I thought it was great although E&P is still my favorite! Definitely looking forward to reading Attachments when I can get around to it. What a great review! I loved how honest you were :) I'm definitely going to be reading this one, along with Attachments. I think and E&P was a one time deal - oh well. Thanks, Nadia! I hated that I had issues with this one, but I just did. lol E&P will definitely be hard to beat. I loved Eleanor and Park so I'll probably give this one a go at some point. I have lowered my expectations now, though. Definitely give it a go, but with adjusted expectations. It's fun but not AS great as E&P. Glad to read your review of this...I'd been waiting ;) Yup, think I'll let the high of E&P go away before I'll try this one. Most definitely a good decision. I think I was safely down from my E&P high before I tackled this. In truth, the issues in this book do seem a little trivial in comparison, but I loved it anyway. Love me some Rainbow Rowell! Her writing is so good. I want to be her bestie. Great review, Andi. I loved Eleanor and Park so much that I don't think any of her other books could live up to it. I'm glad that her writing about relationships (and not just the romantic ones) is still excellent, that's what I loved E&P for. Thanks! And yes, I think I'm gonna feel the same way post-E&P. Awww, sorry to hear that it didn't live up to your expectations! I'm still (STILL!) waiting for my turn at E&P at the library (hold no. 6 now) but as you know, I really liked Attachments and I hope you do too. OMGosh! You have been waiting a long time, but you're in the home stretch now! Oooh great review! I haven't read a book by Rainbow Rowell yet, but I'm interested. It's helpful to know that it's better to start with Eleanor & Park. I'll have to keep that in mind when I finally decide to pick one up! It depends. If you want to have ever other Rowell book ruined because of E&P's epic wonderfulness, start there. ;) Seriously though, it'll be hard for anything to follow E&P. I still haven't read Eleanor and Park (I am the worst), but I'm curious about this one as well. I like reading about twins -- it must be so weird to be a twin, don't you think? 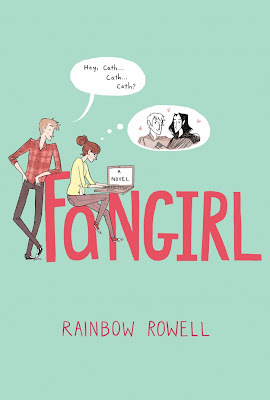 I'm not new to Rainbow Rowell, and I didn't love Attachments, so I am thinking I maybe perhaps will read Fangirl FIRST. FIRST, and then read Eleanor and Park, and that way I will read all her less-awesome books first, and her most-awesome book last, and then she can never disappoint me. I cannot imagine being a twin. Although, twins cannot imagine anything else I'd conclude. Hmmphf. Read Fangirl first. Save the best for last. I read Attachments and really enjoyed it. Think what I'll do is read this one next and build up to Eleanor & Park so I'm not disappointed. There ya go! Sounds like a good game plan to me. Eleanor and Park was so adored by everyone that I don't think that Rowell could have written anything that would live up to it! Maybe she has to go a la JK Rowling and just go in a really different direction to put some distance between E and P and future books. It's a lot of pressure to write up to. And that might be a good idea re: different direction. 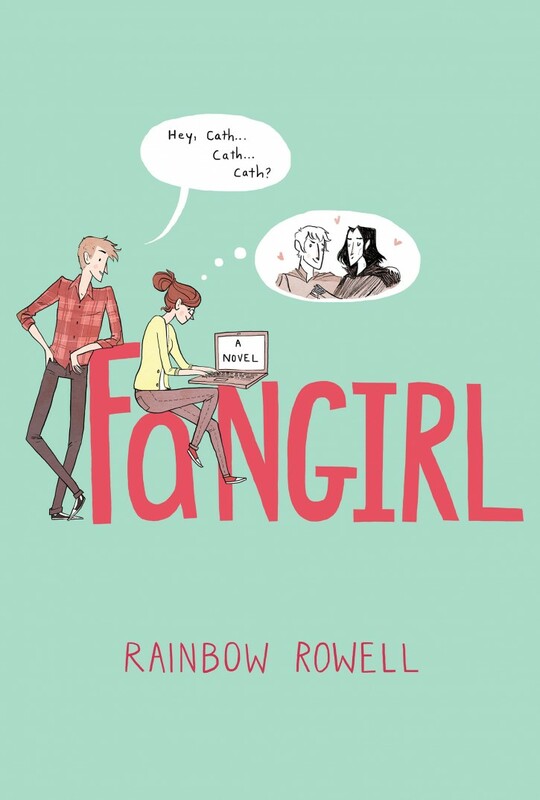 From the cover art, it seems as if Fangirl is intended to be funny while Eleanor & Park was more angsty. If it's funny, I can forgive it all sorts of other flaws! Definitely funnier and lighter. There are still some heavy issues but not the homelife heaviness at the same degree as Eleanor and Park. I think Eleanor and Park is going to be a nearly impossible act to follow. Attachments was a fun book with some plot flaws, and if I read it after E&P I would have been really disappointed. But I do love her writing so I'll keep my bar a little lower for this book. Amen to that. Definitely keep your bar lower, and I'm looking forward to trying Attachments. I'm glad I read your review before diving into this one. I loved Eleanor and Park so much and Attachments was really sweet too. I needed to have a little more perspective on this one. I'm sure I will definitely still read it! I'm looking forward to Attachments, too. I hope you enjoy this one. It's sweet and cute but not an EP equivalent for me. I agree with you about Eleanor & Park being better than Fangirl, but I really liked Fangirl too! The Simon Snow parts annoyed me but I loved Cath and identified with her quite a bit. Rainbow Rowell is basically awesome. I'm sorry to hear that this didn't live up to your expectations. I have been hearing a lot of great thing about Eleanor and Park and still haven't gotten around to picking it up. Even though you weren't reviewing it here, you have strengthened my resolve to get my hands on that book. Maybe then I'll venture into this one. I must say I do love the cover. I loved Eleanor and Park, so I think I'll wait a bit before diving into Rowell's latest release. I don't want to feel let down! With that said, though, lovely Bellezza has sent me a copy of Attachments, which I hope to get to in the coming weeks (months? ).